5 minute Asian salad dressing is tangy vinaigrette made with sesame oil, rice vinegar, honey and soy sauce. Simple to prep and perfect for drizzling on a soba noodle salad, spinach salad, or crunchy cabbage slaw. 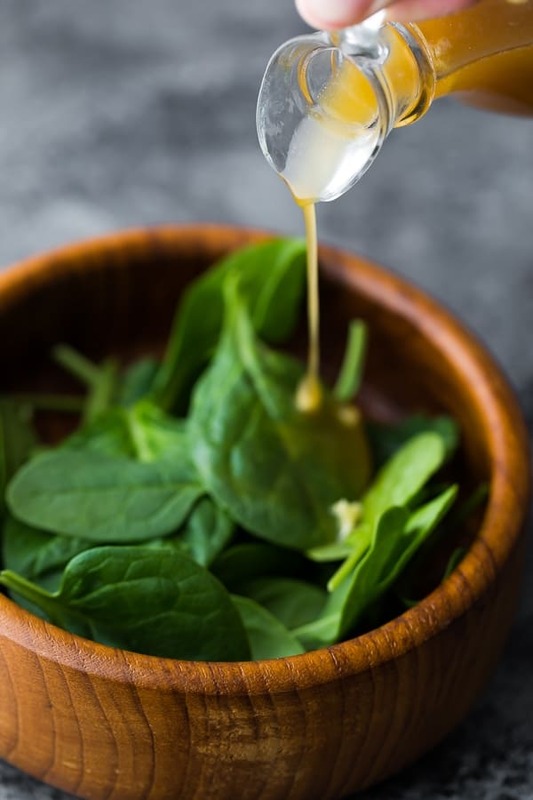 A good vinaigrette gives life to a salad, and this Asian inspired dressing is going to bring a whole lot of flavor to whatever you drizzle it on! Tangy rice vinegar, sweet honey, savory soy sauce, and a hint of sesame oil all work together to give a distinctively Asian flavor to your salad. While it’s easy to reach for the bottled salad dressing, have you ever read the list of ingredients on the label? Kind of scary. 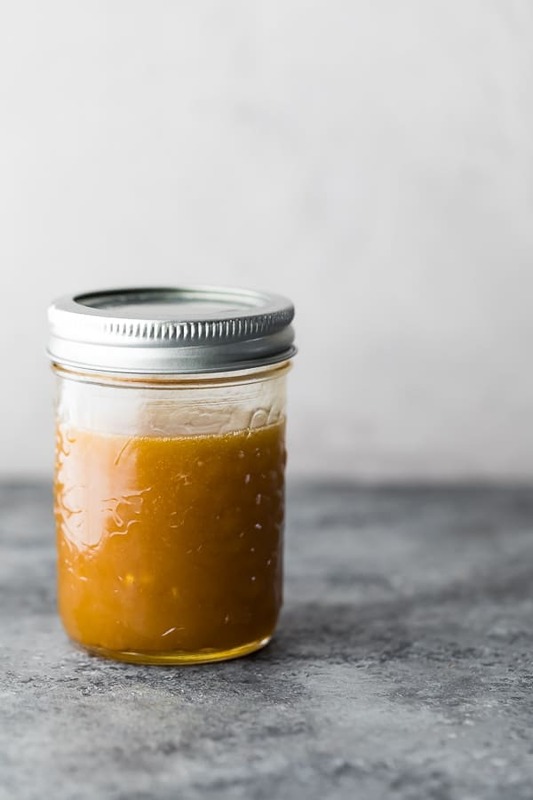 And it’s oh-so-easy to whip up a batch of homemade Asian salad dressing, in fact this recipe is ready in under 5 minutes! You can prep it ahead and stash it in the fridge for a few weeks (probably even longer, although it never lasts that long at our house). You have actually seen this Asian sesame dressing recipe before on the blog, in this Meal Prep Sesame Chicken Pasta Salad recipe, but it was most definitely time to give this recipe it’s own post. 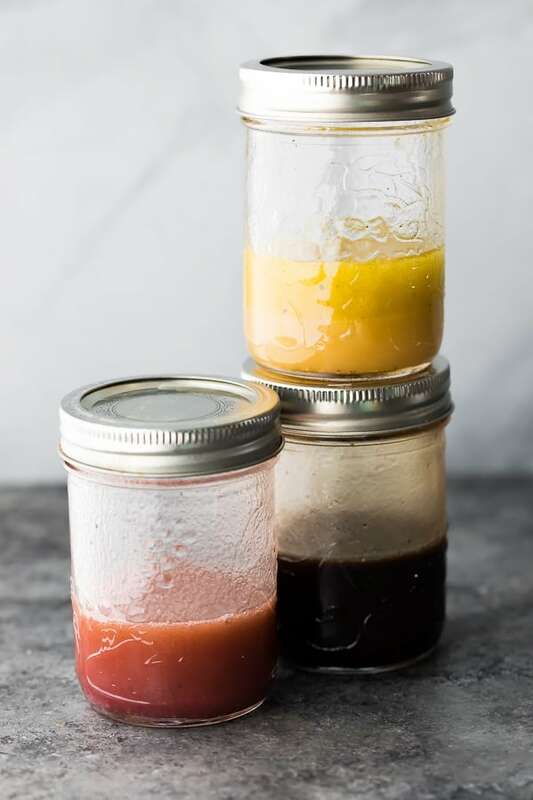 Like my other vinaigrette recipes on the blog, this Asian sesame dressing has an oil to vinegar ratio that is 1:1, in contrast to the traditional ratio of 1:3. This makes it super tangy and perfect to bring a huge punch of flavor to your salads. If you prefer a less tangy dressing, reduce the rice vinegar by 1 tablespoon and increase the oil by 1 tablespoon. olive oil- totally not an Asian ingredient, but it is a healthy and neutral oil. I opt for extra-virgin olive oil for all of my vinaigrette recipes. 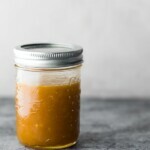 rice vinegar- I used seasoned rice vinegar in this recipe, so if you use an unseasoned rice vinegar, make sure to taste the dressing and adjust salt/sweetener to your taste. sesame oil- this is what brings the flavah to this dressing. I don’t have access to toasted sesame oil, which I hear is more assertive in flavor. 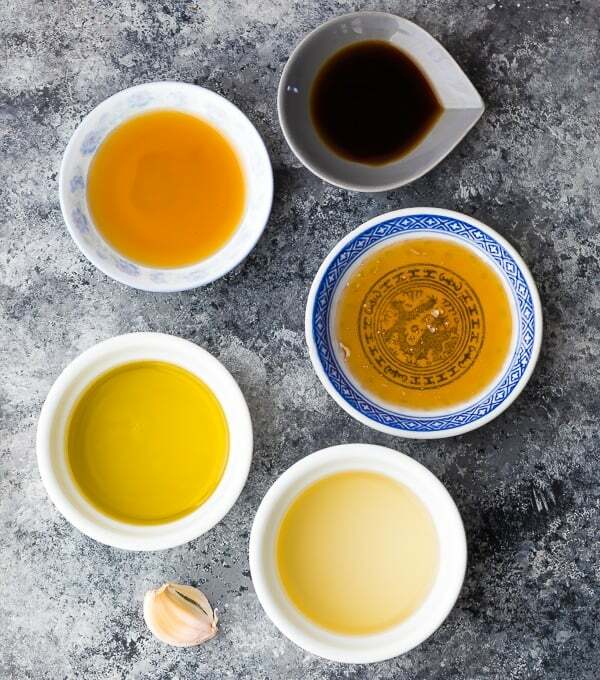 If you are using toasted sesame oil, start with 1 teaspoon, taste, and add more if you’d like. honey (or maple syrup)- a little sweetness is needed to tame the tanginess. 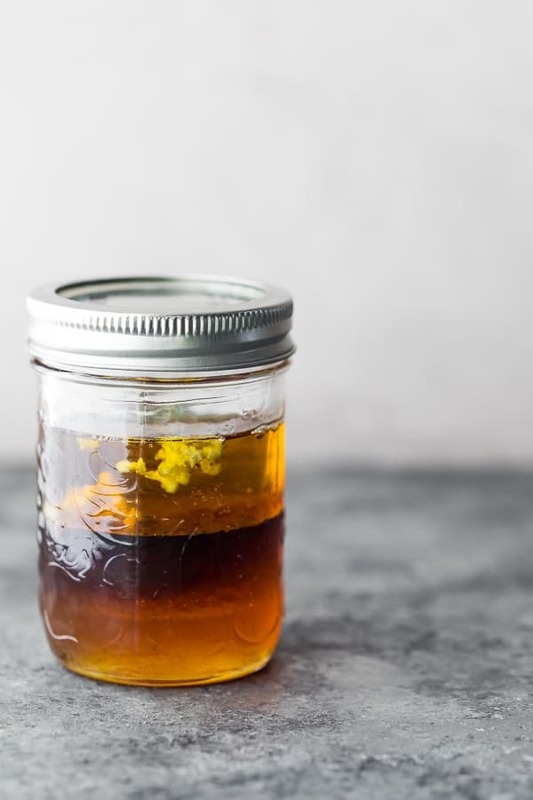 Honey and maple syrup are easily interchangeable in most vinaigrettes at the same ratio. Brown sugar also works in a pinch! garlic– optional, but also brings another flavor dimension to this dressing. What goes well with this Asian dressing? The sky is the limit, this sesame dressing is so versatile! It would be great on a kale salad, spinach salad, crunchy slaw, soba noodle salad. It would be great as a marinade for salmon (sprinkle the salmon with some sesame seeds after baking! ), or chicken. I bet it would even be great as a beef marinade! How long does this dressing last for? This dressing keeps in the fridge for 2 weeks or more, although it never lasts for more than a week at out house. If you add garlic to the dressing you should consume the dressing within a week to prevent food safety issues. make it spicy with some red pepper flakes! I’d start with 1/8 teaspoon and increase from there. I added peanut butter to this dressing! Then tossed it with brown rice, leafy greens, tinned tuna and capsicum for an easy weekend lunch. Yum! I want to try that! 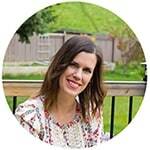 Hi Carly! I do mean 3 tablespoons of sesame oil. I’m wondering if there are differences between brands of sesame oil because mine was not bitter. I will have to retest this recipe. Thanks for your feedback!